Don't miss out - lock in yours place and package price with a deposit payment now! Get on board any one of our superb boats for an amazing week of sailing along Croatia's spectacular Dalmatian coast. Our experienced Fanatics tour leaders travel together with our passengers every day & night. Together with the experienced local captains, crew & chefs on board each of our boats, our crew are dedicated to ensuring your Croatia sailing experience is a relaxed, enjoyable and hassle-free week and an unbeatable group atmosphere for solo travellers and groups alike. Check out our tour video HERE! Our tours all start & finish in Split, Croatia. Fly directly into Split with EasyJet, Croatia Airlines, British Airways, Wizz Air, Eurowings or Ryan Air. If you are coming from elsewhere in Europe such as Greece or Spain you could via one of Europe’s major air hubs such as London, Rome, Milan, Berlin or Amsterdam. Ferries also connect Split with the Italian port of Ancona - see Jadrolinija for details. Split also has a network of national & international coach connections, see Autobusni Kolodvor for more info. Email us at london@thefanatics.com if you have any questions about the tour. Cheap drinks from our on-board bar! Bol - Europe's most picturesque beach! The typical day's sailing includes morning departure from the previous night's port of call (you'll probably sleep through it anyhow! ), breakfast on board, a picturesque cruise along the coast, a late morning swimming stop - think diving into crystal turquoise water, lazing on a lilo & sharing stories from the night before - a relaxing hour or two reclined on the deck chairs soaking up the rays, lunch on board, followed by docking at the next port of call. After we've docked it's time to explore the island, visit the beaches, wander the local streets & markets and take in the local culture before returning to the boat to relax, freshen up, enjoy a drink or cocktail together at the on-board bar before we head out for another amazing sunset and night on the town. It's quite simply one of the most magical experiences you'll enjoy on your European adventures! Your package price includes breakfast & lunch on board your boat together with our tour leader and fellow travellers each day. Breakfast is a healthy continental style serving including cereal, fresh bread & spreads, fruit, coffee/tea and fruit juice. Lunches are a real highlight of the trip and receive rave reviews from all our passengers with a hearty three course meal served every day on board your boat. On our Mljet and Dubrovnik days our included meal is dinner allowing us more time to explore Mljet national park and Dubrovnik’s historic old town during the day. Fanatics package price includes all fuel surcharges & port taxes. The only additional cost you need to pay is the local tourist tax €25 cash to be paid on boarding (once only fee). Breakfast & lunch (or dinner) is included daily. Dinner is enjoyed each night on the islands - the value & range is incredible and no matter what your budget there are options aplenty (eg. a pizza or pasta will cost around 50-60 Kuna - approximately €7), seafood is also incredibly cheap and if you really want to treat yourself to some fine dining you'll easily find fantastic restaurant mains for between €12-€25. Welcome to Croatia! Check-in with our tour leader in front of Split harbour between 11am & 12:30pm. Details on getting to our meeting point will available on our tour website one month before the tour. If you arrive into Split after 12:30pm you can meet up with the tour at our first stop of Makarska (see the arrival map for details). A compulsory €25pp (or 200 Kuna) tourist tax is payable in cash when boarding (note that fuel surcharges & port taxes are already included & paid in your Fanatics package price). After lunch we sail south along the Dalmatian coast to the town of Makarska where we spend the afternoon swimming and lazing about on one of the many beautiful beaches on the Croatian Riviera. Makarska is one of the most attractive resorts on the Croatian coast. Those feeling adventurous can join a white water rafting excursion on the Cetina River. We spend the evening in the port of Makarska where you can grab some dinner, stroll along the historic streets and enjoy our opening night party at Makarska’s famous cave bar! This morning we depart Makarska for Mljet, first stopping on the Peljesac peninsula for a refreshing swim. Today we have an optional bike & bbq tour in Mljet National Park (HRK 350 including park entry, bicycle hire & bbq lunch with drinks). The tour cycles along the salt lakes of Mljet National Park, otherwise you can simply enjoy the sun and sea on this peaceful island. In the middle of the largest lake you can visit the picturesque abbey and church. Tonight we sail on to our private bay where today's included meal is dinner on board before we party the night away with our fellow passengers! After breakfast we depart for Dubrovnik - one of the highlights of any Croatian cruise. As always along the way we'll be stopping for a swim in the magical waters of the Adriatic. Upon arrival in Dubrovnik the afternoon is free for you to explore the glorious old town & experience its amazing vistas with the group or you can join an optional guided tour of Dubrovnik. 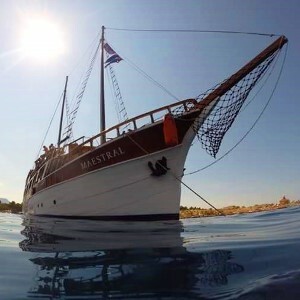 Today’s included meal is an evening dinner on board our boat giving you maximum time to explore Dubrovnik during the day, there are plenty of good value lunch options nearby that your tour leader will point out. In the Middle Ages Dubrovnik was the only city-state to rival Venice and the riches of that era are still in evidence today. Discover the beauty of this Mediterranean gem through its numerous monuments, tiny streets and churches, take a walk through Stradun – the old city’s main street, relax in one of the many café-bars or those of you with plenty of energy might want to walk along the 1,940m-long city walls! This is one destination you definitely will never forget. This afternoon you might want to join an optional activity such as the Game of Thrones tour or a kayaking trip taking in the old city walls from the water. After a full day of sightseeing we head back to the boat for dinner and some on-board cocktails before hitting the nightlife of Dubrovnik's old town centre. This morning we depart Dubrovnik and continue our cruise to the gorgeous island town of Korcula, the birthplace of Marco Polo. Korcula is one of Croatia's most historically significant towns & as well as its architectural splendour it also boasts one of Europe's most stunning sunsets which we'll be enjoying together with cocktails in hand! On this island you can find more legends, tales and monuments to the region’s past than anywhere else along the Dalmatian coast. This morning we depart for the Pakleni Islands for lunch and another amazing swimming stop before heading to the island of Hvar. Hvar is the longest island in the Adriatic. Here you can find medieval monuments such as the Renaissance cathedral with its original tower and the oldest community theatre in Europe – founded here in 1612. The city of Hvar offers plenty of entertainment with restaurants, bars and cafes that are open long into the night! Today we make our way to the island of Brac and the magical beach town of Bol. Situated on a secluded peninsula, Bol is the oldest town of Brac and one of the most famous seaside resorts of the Adriatic, pictures of which adorn every Croatian advertisement! This morning we travel along the beaches of the island of Ciovo, along the way stopping for a swim (or paddle on the lilos!) in the incredible turquoise waters surrounding the island before enjoying another hearty lunch on board the ship. We arrive back into Split this afternoon where you can join an optional guided city tour. Split is a monumental city under UNESCO protection and an incredible venue for our tour farewell. Here we find an abundance of Roman architecture including the Diocletian palace. After taking in all of the sights the city has to offer we head out for our final night together. After breakfast our tour ends and it’s time to say goodbye to the crew and fellow passengers. June 29 - Early Bird Special! July 6 - FINAL CABIN! July 13 - FINAL BED!